Embark on a magic Christmas season evening. On board a La Marina boat-restaurant, you will enjoy a sumptuous gourmet dinner. You will go to the boarding area located at Port de Solférino, at the footsteps of the Musée d'Orsay, to board the boat at 8:45 p.m. The cruise departs at 9:15 for a fairy tale visit: Christmas in Paris. Seated at a festively decorated table for two, or for your family, you will enjoy a refined gourmet dinner on the Seine. Especially designed for the occasion, the meal will enchant you with its variety of entrees and desserts, and its inevitable Bûche de Noël (Christmas log). It begins with a champagne aperitif to properly celebrate the Christmas Holiday. While savoring this holiday menu, you will enjoy the panoramic view of the lights of Paris, in a friendly, glass enclosed setting. Your trip over the water will let you discover the most beautiful monuments of Paris located along the Seine, decorated with stunning Christmas decorations. You will marvel at the symbolic sights of the City of Light, such as the majestic Cathedral of Notre Dame, the Louvre Museum, the Conciergerie and the must see Eiffel Tower. 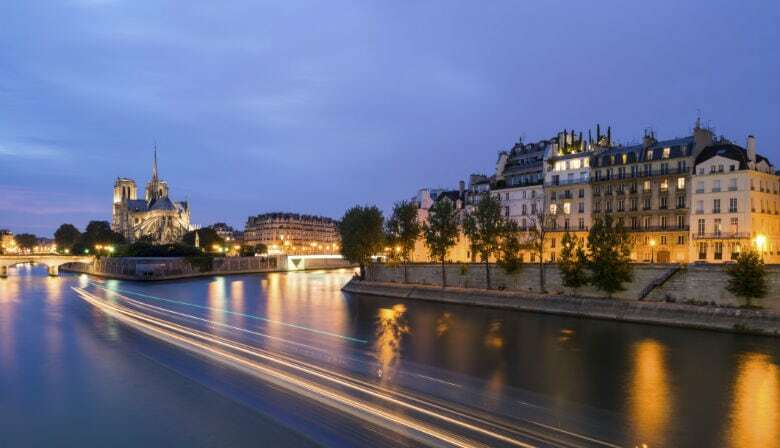 You will also enjoy the view of the lighted bridges that cross the Seine, such as the magnificent Pont Alexandre III, the charming Pont des Arts and the Pont Neuf (“New Bridge”, but it is famous for being the oldest bridge in Paris!). In this warm atmosphere, you will be lulled during the cruise by the traditional songs of Christmas. Travel along the Seine admiring the most beautiful monuments of the centre of Paris as they drift by. At 11:00 p.m., you will have the chance to see the Eiffel Tower fully illuminated, before making the return trip to Port de Solférino to arrive at about 11:15 p.m.
You will receive confirmation of your tour booking by email, along with a voucher. Print your voucher and present it at the boarding area of the La Marina PARISCityVISION boat.